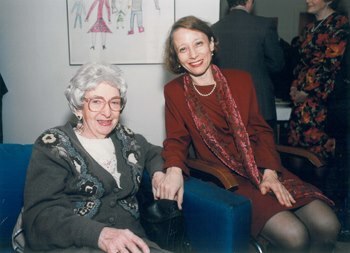 Dorothy Taubman with Edna Golandsky (private collection). Dorothy Taubman (August 16, 1917 – April 3, 2013), made an invaluable contribution to the understanding of piano playing. Initially her main focus was uncovering the often invisible elements underneath a fluent, virtuoso technique, whether in a child prodigy or professional pianist, which developed over forty years into a profound system of pianism known as “The Taubman Approach”. Her research uncovered that applying the principles of a healthy, high level technique is therapeutic, enabling often crippling playing-related injuries to be overcome. Mrs. Taubman was one of the first to controversially decry musicians’ injuries in the 1960s, and to identify their specific, playing-related causes. Mrs. Taubman’s body of knowledge has allowed thousands of musicians to not only be freed of discomfort, pain and technical limitations, but to reach new levels of pianistic skill and artistry. Rather than advising “more practice”, the Taubman Approach offers step-by-step rational solutions; musicians are given the tools to grow into their best pianistic selves. For over two decades, Mrs. Taubman was the artistic director of the Taubman Institute, firstly at Amherst College, later at Williamstown. Apart from being sought after by pianists from around the world, Mrs. Taubman taught at Queens College and Hunter College in New York. Long-term students included Yoheved Kaplinsky, ( now Julliard School of Music), and Edna Golandsky (Director of the Golandsky Institute, USA), considered the primary exponent of the Taubman Approach. Unfortunately, I never met Mrs. Taubman, yet she has changed my life, as she has thousands of others. This July when I attend the Golandsky Institute marks ten years since I first started studying the Taubman Approach, allowing me to pursue an active performance career after being injured for nearly a decade, and to share this knowledge in my teaching. Mrs. Taubman’s legacy will continue through many committed Taubman teachers, including Edna Golandsky and John Bloomfield, the wonderful pedagogues who continue to develop my playing and teaching to deeper levels. Apart from her incomparable insights, Mrs. Taubman will live on through the seemingly never-ending array of anecdotes her students share: her humour and pithy quotes, her passion, her creativity, her refusal to accept long-held traditions without question, and her dedication to her life’s work. With enormous gratitude from the bottom of my heart, thank you Mrs. Taubman.